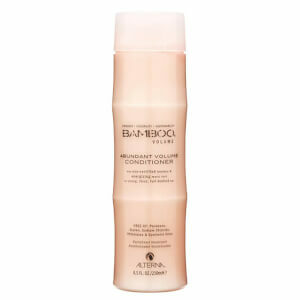 Provides full-bodied volume that lasts 48 hours. Significantly enhances volume leaving hair visibly thickened and noticeably denser. Super lightweight formula contains plumping technology specifically created for women with even the finest hair types. Will not weigh hair down, never sticky or crunchy. Organic Bamboo Extract: Immediately boosts hair's intrinsic strength, flexibility and sustainability for stronger, healthier, better-performing hair. Organic Maca Root: A natural "stimulator," Maca Root is an invigorating hair ingredient full of phyto-nutrients that make hair look fuller and feel stronger. Volume Last Technology: Combines the most advanced volume enhancing polymers with a weightless conditioning system for fullness and thickness that lasts for a full 48 hours without dryness, flyaways or static. After cleansing with BAMBOO Abundant Volume Shampoo & Conditioner, spray throughout clean, towel dried hair prior to blow drying. Water (Aqua), Polyimide-1, PEG-40 Hydrogenated Castor Oil, Sodium Benzoate, Palmitamidopropyltrimonium Chloride, Chlorphenesin, Citric Acid, Disodium EDTA, Linalool, Methylisothiazolinone, Limonene, Helianthus Annuus (Sunflower) Seed Oil, Polysilicone-15, Bambusa Vulgaris Water, Phospholipids, Bambusa Vulgaris Extract, Lepidium Meyenii Root Extract, Saccharomyces/Magnesium Ferment, Superoxide Dismutase, Saccharomyces/Iron Ferment, Saccharomyces/Copper Ferment, Saccharomyces/Silicon Ferment, Saccharomyces/Zinc Ferment, Fragrance (Parfum). The volume lasts the promised 2 days.Smells just amazing! Recommend. This spray noticably leaves my hair fuller and fluffy rather than flat. It gives me a chance to simply touch up my hair rather than a full shampoo and blow dry to regain fullness on a second or third day. I was always one to have to wash and blow dry my hair every single day; not because it was dirty but to keep it from being flat on my head. Now I can simply touch up the ends and go. Even makes that second day pony tail look clean and full against my head rather than slicked back as if it was dirty when it's not. I have fine hair. Long and lots of it, but fine. I've tried several other products that promise to add volume, but this is the best one by far. It creates volume if I curl or straighten my hair. Lasts all day, without the need for "re-fluffing" by the end of my work day. Great product! I even introduced it to my hairstylist - she loved the results and plans to use with other clients. I will continue to buy over and over! Due to an autoimmune disease, my hair is extremely fine and has thinned out considerably. I was very self concious about my hair until I found this product. Very volumizing, doesn't leave my hair sticky or hard. I just love it! Bouncy hair the next day! This spray is great for natural looking volume. It is also great if you don't wash your hair the next day, as it doesn't weigh your hair down with anything sticky or waxy like some of the texturizing products. Love it for everyday use. I have shoulder length hair that is fine and color treated. I've tried just about every volumizer out there-- from super pricey to drugstore, and this is the best hands down! I am on my third bottle. The key is that you must use it liberally and you must BLOW DRY your hair or it won't work properly. If you plan to air dry, don't bother with this one! This keeps my hair full and bouncey for 2 days, and its never sticky or stiff. Love it!!!! My hair is blond, long and fine and falls past my shoulders. I've always been interested in products that are supposed to amp up the volume. My hair is in very good condition as I don't use heat styling or brushes and rarely blow dry, so I was surprised this product caused major static and fly away. I tried it several ways, I sprayed it on damp, combed hair and then let it dry naturally. I repeated the next day and used it exactly as directed and blow dried it, I also tried it on dry hair, and each time it was a no-good. I have to return this considering how pricey it is.